Why Master Precision Test Specimen? 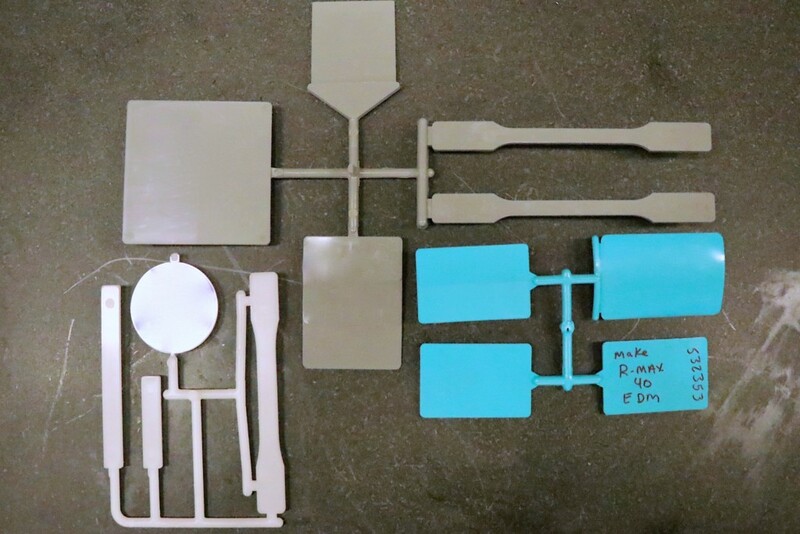 • EXPERT in Test Specimen Molding Due to the complexity of test specimen material testing, it is often overlooked. Master Precision has earned a reputation as the "go-to" people in the field with five decades of experience in creating exceptional test specimen. Early on in our history, the quality of our mold making lent itself well to the strict requirements of scientific testing machinery. Master Precision strategically developed an expertise in the test specimen mold building field. We are the largest builder of test specimen molds in North America. 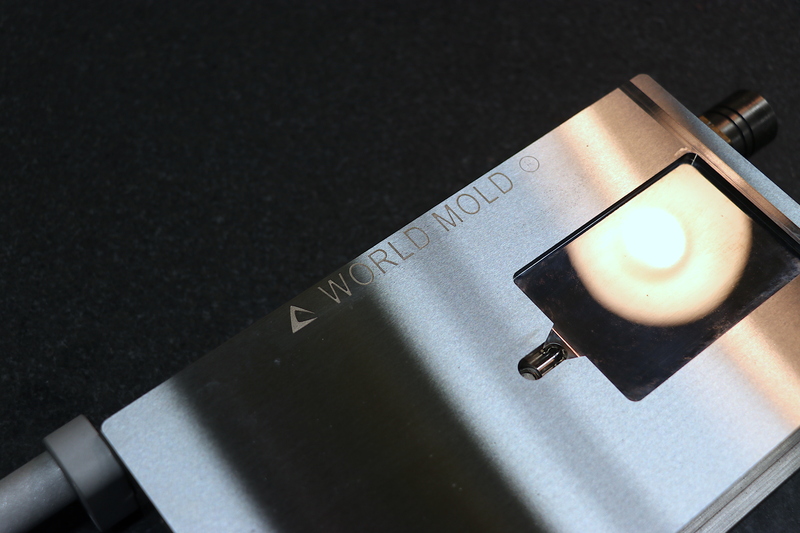 Our mold systems are shipped all over the world. Among the various test specimen required by our clients are color plaques, tensile bars, and specimen specific to the ASTM D638 standard and ISO 294 standard. 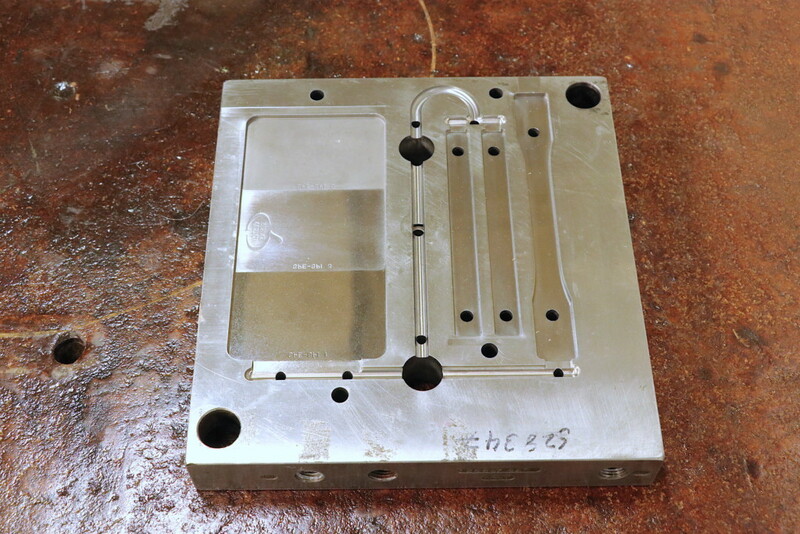 Historically these molds have been called simply an ASTM mold or ISO mold (ISO Mould). If you require an ASTM Test Specimen, ISO Test Specimen or another appearance or testing specimen please look at the PDF downloads at the bottom of this page. In these documents, you can study the details of the specimen and the molds that produce them. All of this is provided in an enjoyable, professional manner by our knowledgeable staff. ISO 9001 quality system ensures tight control of our processes. The end product is world class and is provided to you quickly and cost effectively. We invite your inquiries. Early involvement in the material testing field has given us a valuable expertise in the strict quality needs and processing demands of Test Specimen molds. 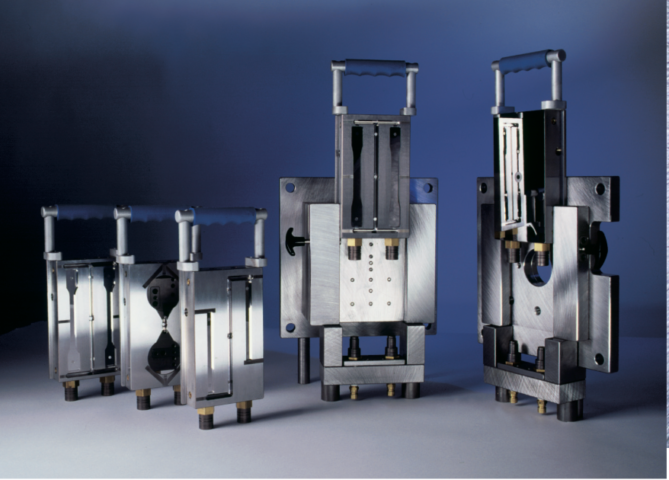 We have worked extensively with material manufacturers and compounders to develop a line of standard specimen molds. R&D facilities, quality control departments, and educational institutions use our molds as a standard throughout the plastics world. • The mold is dedicated to that one specimen. • Changing the mold is not difficult. It requires a hoist and takes slightly longer than other two mold styles. • Mold Base Test Specimen Molds are built to same high standard as all Master Precision Molds. 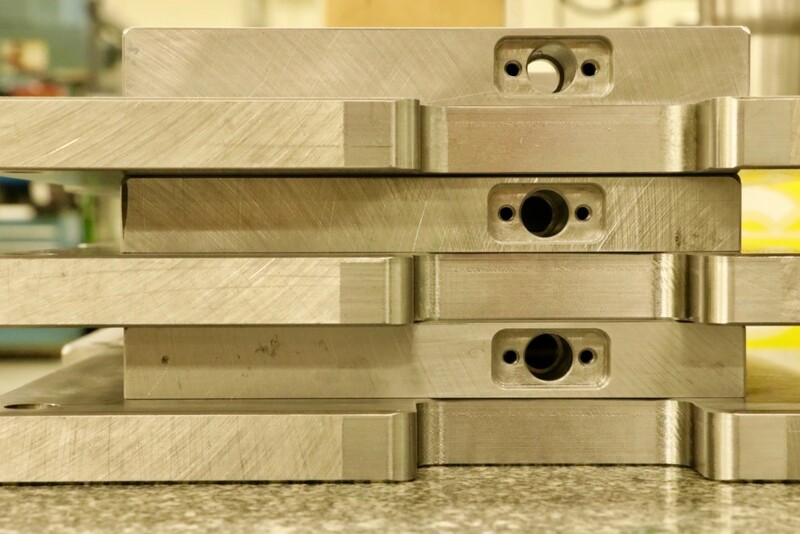 • We can build any standard or custom configuration in a mold base. • If having different types of a specimen or easy mold changes are not as important as cost, a mold base is a perfect solution. 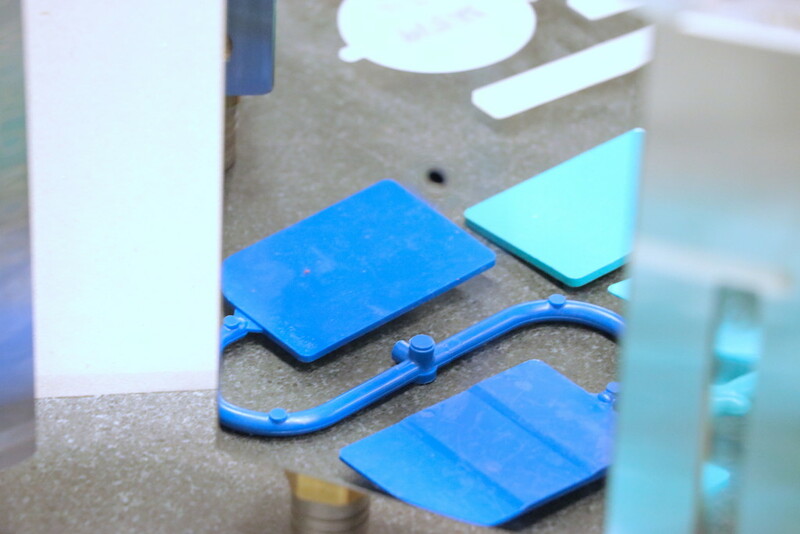 With an insert mold, the frame stays in the molding machine and the smaller mold inserts and locks into the frame. 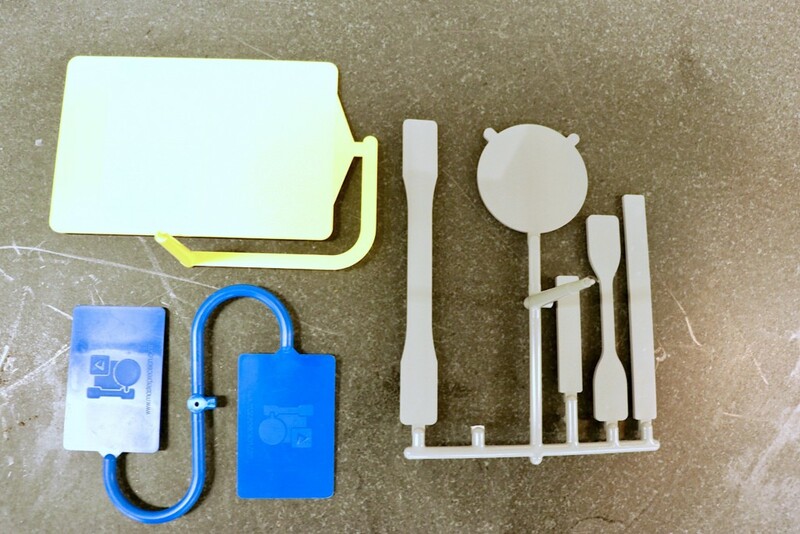 The standard test specimen series was designed for Insert molds. • The initial insert and frame investment is more than a mold base but after the frame is purchased the insert molds themselves are less expensive. This is a reason we have insert molds installed all over the world by the hundreds. 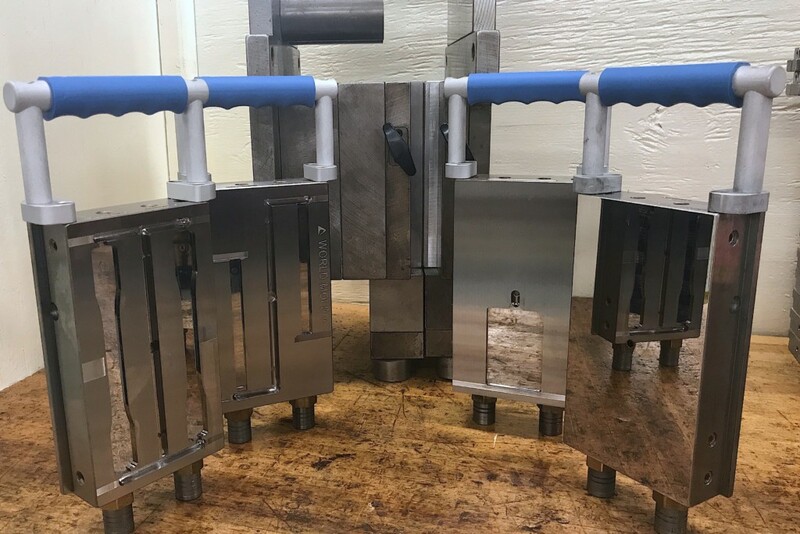 • This type of mold is easy to handle and can be changed from the molding machine in a matter of minutes with a small hoist. • Insert molds are preferred by molding labs with medium to high volumes of test specimen runs with many mold changes. • All Master Precision Molds are built to very high internal quality standards and 100% tested before shipment. We test for both quality of part and compliancy to the molding standard you are requesting. If you wish we will provide you with sample parts before we ship you the mold. What is the WORLD Mold™? A system consisting of a flat polished mirror plate, a very small mold plate, and a larger base that stays in the molding machine. All molds are made of 420 Stainless steel for productivity and longevity. The mirror plate and mold cavities are polished to an SPI A3 diamond finish. The novel ejector system is half in the insert mold and half in the base. All mold plates and mirror plates come with soft touch rubber lift handle for comfort and safety. A T-handle offers a quick release and lock of molds. The base is made of 4130 prehardened steel. 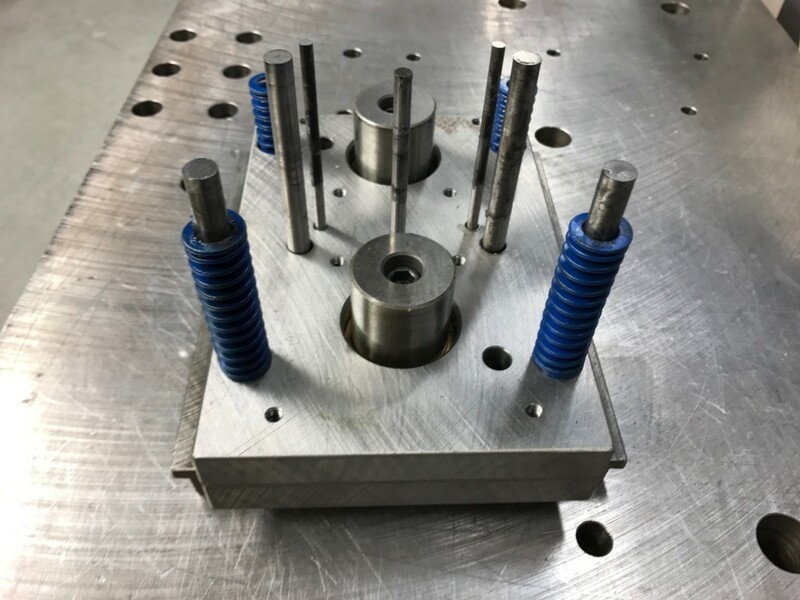 The system is customized for your molding machine with your particular mounting hole locations, locating ring, knock-out holes, and sprue size. All Molds are 100% tested with our plastic or you can have a pretest by providing your plastic blend. This is the finest Test Specimen preparation mold you can buy. We will put the WORLD in your grip!